At the factory, your DS64 was set to control solenoid type turnout machines that use a single pulse output for operation. If you are using solenoid type turnouts, you can install the DS64 “out of the box.” If you have reconfigured your DS64 for stall motor type turnouts, the DS64 can be reconfigured back to solenoid type turnout motors. 1. Connect the DS64’s ‘TRKA’ and ‘TRKB’ terminals to your track. No turnouts should be connected to the DS64 at this time. 2. On the DS64 press and hold the OPS button down for about 3 seconds until the red OPS LED and green ID LED begin to blink alternately. This indicates that the DS64 is ready to change the option switches. To run the type of turnout you have chosen, you’ll need to follow step 3 to change Option Switch 1 to thrown to operate a solenoid type turnout. 3. 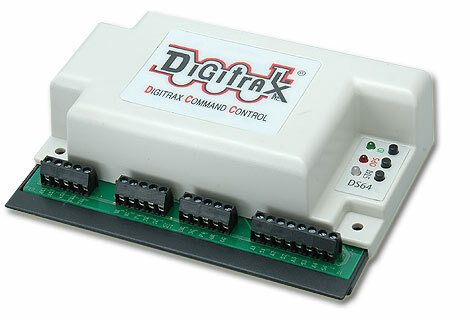 Using your DCC throttle, select Switch Address 01 and send a Thrown command. This will set your DS64 to operate solenoid type turnouts. Refer to your DCC throttle’s operating guide for specific instructions for selecting switch addresses and sending switch commands.